The 100% natural curcuminoids complex in Super Bio Curcumin® is a patented synergistic blend of curcuminoids and sesquiterpenoids. 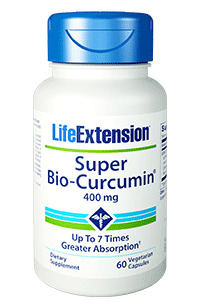 Each 400 mg capsule of Super Bio-Curcumin® is equivalent to 2772 mg of a typical 95% curcumin (active constituent of turmeric) extract. Caution: Do not take if you have a biliary tract obstruction. Use during chemotherapy should only be performed under the direct supervision of a qualified medical professional. Curcuminoids may enhance the action of anti-platelet drugs and the effect of warfarin.